There had been so great an abundance of copper coin issued during the last years of the reign of William, and so many complaints were made by the tradespeople, both as to the quality and quantity of these, that acts of Parliament were presented to the House of Commons in 1699 and subsequently, to stop the excessive issue. This, however, appears to have been without result, as the coins of 1699, 1700 and 1701 are as abundant as the earlier ones. In consequence of this position of matters no fresh copper coinage was found to be necessary when Queen Anne ascended the throne. During the last two years of her reign, several patterns for copper coins were engraved at the mint by Croker (or more properly Crocker) a German by birth, who was then Principal Engraver at the Mint. These were struck with artistic designs in accordance with suggestions made to the Lord Treasurer by the celebrated Dean Swift. None appear to have been put into circulation, with the exception of the farthing No. 15, and many of the specimens, especially of the halfpennies, which occur in cabinets, were probably struck from the dies after the Queen's death. The farthing No. 15, was struck for currency, and is therefore much more common than the others, notwithstanding the vulgar error which once prevailed to the effect that there were only three ever issued, owing to the alleged fact that after three impressions had been struck the die was fractured. The effect of this error is that the officials at the British Museum are constantly offered examples at absurd prices, and the deluded owners have in some cases suggested a value from £300 to £1000. The tradition was that two specimens were known but that the third had always remained undiscovered. This error was in 1814 the ground for serious litigation in Dublin, and to repeat the words used in the Numismatic Journal, Vol. I., p. 267 (where the trial of the case is reported), "the Counsel, Judge, and Jury all followed each other, like sheep leaping a dry ditch; and that for borrowing and detaining from a friend the supposed third farthing, one George Hone was sentenced to be imprisoned for twelve calendar months and afterwards to find sureties." The following is a list of such of the patterns before referred to as are known to exist. 1. O. ANNA. DEI. GRATIA. The queen's bust in high relief and of fine workmanship; a fillet of pearls twisted in the hair and falling behind. The bust gracefully draped. R. Same as obverse. R. 6. The edge of this piece is sometimes uninscribed. A variety has DECVS. ET. TUTAMEN. ANNO. REGNI. DVODE+. (British Museum, and Durrant's Sale, Lot 887) or DVODECI. (H. Robson's Sale, Sotheby, 1840), but as I have a specimen in a very high state of preservation, which reads DECVS. ET. TVTAM. ANNO. REGNI. DVODEC+, and on which the concluding letters of TVTAMEN. and DVODECIM. are clearly traceable under what follows each of those words, the mystery is easily explained by the fact that the legend (being the collar of the half crown), considering the size of the lettering adopted, was too long for the edge, and the engraver adopted a slovenly expedient to cure this. 2. O. ANNA. AVGVSTA. The queen's head as before. R. Same as obverse. R. 8. This is in lead with a plain edge, and is in the National Collection (from the Alchonre Sale, Lot 188), and is believed to be unique. In the same collection is another specimen in the same metal with a plain edge, and with the Queen's bust on both sides, but with no legend on either side. The following patterns are altogether of a different style of workmanship, and do not at all resemble Croker's work in connection with copper coins, although somewhat like that on the silver coins engraved by him. The relief is lower, and the details more minutely elaborated. Unless otherwise stated they are all struck in copper only. I insert Nos. 7, 9 and 10 on the authority of the late Rev. Mr. Christmas but with the greatest hesitation as, never having seen or heard of any example of any one of those types, I consider that it is more than probable that they do not exist. 3. O. ANNA. D. G. MAG. BR FR. ET. HIB. REG. The queen's bust without any fillet or ornament in the hair. R. No legend. The queen with the attributes of Britannia seated under a crown, holding in her right hand an olive branch, in her left a spear; her right leg bare. R. 5. 4. O. Same as No. 3. R. Same as No. 3, save that a rose and thistle, with leaves, on a single stem, are substituted for the olive branch. R. 5. A variety of this pattern occurs in fine brass, and one in silver is in the National Collection. 5. O. Same as No. 3. R. A rose and a thistle, each with leaves, opening from one stem and surmounted by a crown. R. 4. Bronze proofs occur. A specimen in silver is in the National Collection. 6. O. Same as No. 3. R. Similar to No. 5, but without the crown. R. 4. Bronze proofs occur. There is a difference between the design on the reverse of this pattern and that on the reverse of No. 5. On the former one small leaf only issues to the right of the rose; on the latter, two lower ones and three upper ones. 7. O. Same as reverse of No. 3. R. Same as reverse of No. 5. 8. O. Same as reverse of No. 3. R. Same as reverse of No. 6. R. 4. I have patterns in silver, copper and bronze of this type in my collection. There is one also in silver in the National Collection. 9. O. Same as reverse of No. 4. R. Same as reverse of No. 6. 10. O. Same as reverse of No. 5. All the above, from Nos. 3 to 10, are without a date. Snelling, whose work on the copper coinage was published in 1776, states that after Croker's death in 1740 the dies passed into the hands of Mr. Bush of the Ordnance Office in the Tower. The latter caused some impressions to be struck off, and the Hon. Richard Arundell, who held the office of Master of the Mint from 1733 to 1740 hearing of this, ordered the dies to be destroyed, which was done. The modern-struck impressions, some of which, as will appear from the foregoing list, are of a very capricious nature, must have been struck, therefore, in 1740. Some doubt has been expressed with regard to the work having been that of Croker, and the names of other artists have been mentioned in connection with these pieces, but the evidence is strongly in favour of their attribution to Croker, and the claims of some of the rival engravers mentioned, are disposed of by the fact that pattern No. 3, is described by Leake in his "Historical Account of English Money," which was published so far back as 1726. 11. O. ANNA. DEI. GRATIA.. The queen's head as on the pattern halfpenny No. 1. R. BRITANNIA. 1713. The date in the legend. The figure of the queen as Britannia, as usual, with an olive branch in her hand. R. 4. This coin has a very broad rim on both sides and occurs in gold, silver, and bronze or copper. A linear inner circle occurs on the obverse of the gold and silver proofs and on the reverse of all examples. Impressions from more than one die occur. I have one on a thick flan of a yellowish metal in my cabinet (formerly Bergne's, Lot 1080) on which the lettering is more florid, and that on the reverse is much smaller than usual, and on which the inner circle on the reverse is ornamented. A copper example, also in my cabinet, of the usual thickness, has a dot after 1713, and the A's in GRATIA are properly barred. This is not so in the case of the before mentioned variety, which may be a late impression. I have also an example in copper with large lettering and no inner circle on the obverse, and this, I believe, also occurs in silver. 12. O. ANNA. DEI. GRATIA.. The queen's bust as on No. 11. R. BRITANNIA. Broad grained rim. The queen with the attributes of Britannia as usual, seated under a portico. In exergue, 1713. R. 4. This also occurs in gold, silver and copper or bronze. A variety has smaller letters and wants the broad rim. 13. O. ANNA. AVGVSTA.. Bust of the queen similar to that on No. 11, but in yet higher relief and of finer workmanship. Broad grained rim. R. PAX. MISSA. PER. ORBEM. Peace in a biga, holding in her right hand an olive branch, in her left, a spear. In exergue, 1713. R. 6. This is found in gold, silver, tin and bronze or copper. Some in silver are struck on much thicker flans than others. I have a copper pattern of this farthing with a narrow beaded inner circle struck as a flan of a slightly larger module. It is most probable that the features of the figure of Peace are intended to be those of the queen. The design was adopted to commemorate the Peace of Utrecht. 14. O. ANNA. REGINA.. Bust as on No. 11. R. BRITANNIA. 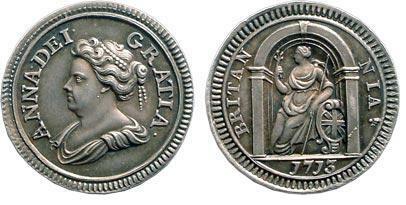 Figure of Britannia, more fully draped and bosom and leg not bare. Laurel branch in her hand, which is not raised as on previous patterns. In exergue, 1714. R. 6. This occurs in copper only. 15. O. ANNA. DEI. GRATIA.. Bust as on No. 11. R. BRITANNIA. Figure as on No. 14. In exergue, 1714. R. 3. This, as before stated, was intended to be the current farthing, and it was probably in circulation for a short time before the death of the queen. This event, which occurred shortly afterwards, induced those who were in possession of the limited number of examples already issued, to hoard them as memorials of the deceased sovereign. It occurs in silver, bronze and copper. I have one of a smaller size in copper, which is from a different die; the lettering is of a more florid character, and there are no dots after the words on the obverse. 16. O. ANNA. DEI. GRATIA.. The queen's bust within a double inner circle, under the head a scroll. The letters of the legend on both sides are sunk instead of being raised. R. BELLO ET PACE. Britannia helmeted and standing, holding an olive branch in her right hand and a spear in her left, in a double inner circle. In exergue, 1713. A broad grained rim. R. 7. This piece (incorrectly engraved in Ruding, Suppl., Part II., Pl. IV., No. I. ), is very rare. For reasons stated fully by me in my contribution to the Numismatic Chronicle (3rd Series, Vol. VII. ), there can be little doubt that it was struck as a jetton to commemorate the Peace of Utrecht and not as a pattern for a farthing. Examples occur in the Hunter Collection and in the National Collection; the latter in poor condition. In the Bergne Sale (Lot 1076) there was one described as being in pewter or mixed metal. This piece, subsequently acquired by Mr. Shorthouse, was sold by public auction on December 2nd, to Mr. J. G. Murdoch. It is of copper of inferior quality.